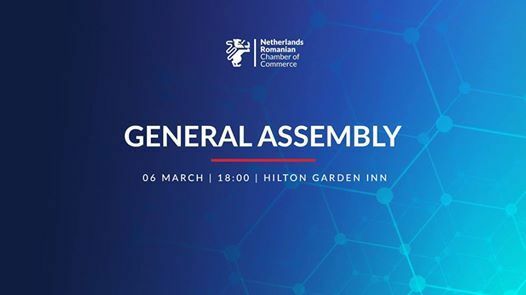 On 6th of March 2019, NRCC will hold its annual General Assembly of Members, starting with 18:00 o'clock, at Hilton Garden Inn Bucharest Old Town. On this occasion, 4 positions in the Board of Directors will be up for voting. All member companies interested are invited to delegate their candidates. 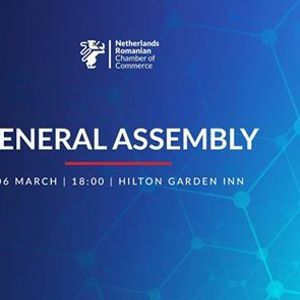 The Agenda will include also a 30 minutes Q&A session, so all members are invited to send relevant questions regarding the Chamber's activity at aW5mbyB8IG5yY2MgISBybw== for the NRCC President & Executive Director. - Building partnerships with Dutch and other bilateral Chambers. •	Liaise between NRCC and other associations where ING is a member (i.e. ARB, CPBR, FIC) to strengthen the lobby initiatives for our members. I am asking the members for their support to be appointed as board member of the NRCC." "I do consider that the company I represent has both the duty and the responsibility to be actively involved in the most important and effective platforms for interaction between business sector, authorities and society. 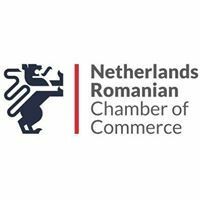 A mandate within the NRCC Board of Directors would give me the opportunity to continue to seek new solutions and ideas in order to help the Romanian business environment achieve its full potential, a process that requires long-term efforts and involvement. My contribution to the Board of Directors is my vast skills in banking and finance. Therefore, I consider that my experience, skills and competencies could bring value and produce significant change in many fields that are instrumental for the NRCC activity. Should I be elected in the NRCC Board of Directors, I will pledge for NRCC to become an even stronger voice for the business community, as more and more challenges need to be overcame nowadays. I also find that promoting the principles of good corporate governance and business ethics is important in economies such as Romania. Last but not least, issues related to the corporate finance remain my main area of interest and focus within NRCC in order to diversify the financing solutions necessary for the businesses operating in Romania, so that they increase their value within the economy. " " I am an active member of NRCC since 2008. In my 10-years relationship with NRCC, I’ve managed to be part of the Board, to be Vice-president, to participate in organizing numerous events, including revitalization of the Orange Night, Knowledge Center on Employer Branding, Women’s Day, participation on even more events such as Dutch Drinks, Knowledge Centers, visit to Damen, etc. I am motivated to become part of the Board of NRCC because of the need to have for strong female leaders entrepreneurs, and Romanian, representatives of small business local enterprises in the Board. I’ve reached a level of maturity and emotional intelligence which enables me to give back a lot. I have a steady work-personal life balance and, therefore, I would like to be more active withing the NRCC - a community which I value very much." "The values I believe in, represent both me and the team I work with. I always treat my clients and projects with dedication, fairness, respect and professionalism. We always try to offer the best solutions to see our clients as satisfied. We respect our commitments, clients and business partners. The entire team is made up of specialists who are constantly developing to meet the highest demands of their clients. These values are the ones that have helped us over the years to grow on a challenging market. One of the greatest challenges for a Romanian entrepreneur is to develop into an international market. Competition is fierce and our efforts to provide quality services and products place us on a premium market segment. Also one of our objectives is to contribute to the development of the economic environment in Romania. I have much to offer in the way of diversity of experience and profession in that I have worked until now. In my past and current positions, I have gained experience in entrepreneurship, leadership, interior design, sales, human relationships. Combine all of this experience with my desire for continuous learning and development, understanding the economic and social environment. Finally, I would like to be part of the NRCC Board to collaborate with people with whom I share common passions and interests, and to contribute to the development of the team through my knowledge, experience, brand or sponsorship. As a Board Member, I take the responsibility to be present at NRCC events and to represent the NRCC at any occasion." The General Assembly will be followed by an After Drink only for NRCC members.